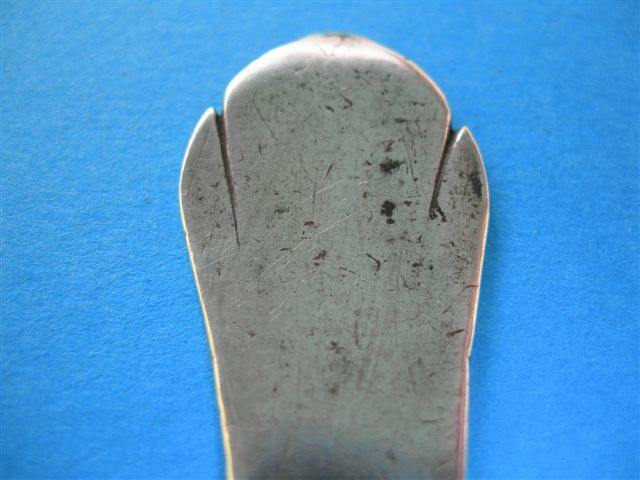 During a recent auction, it was my pleasure to appraise the fork represented above. 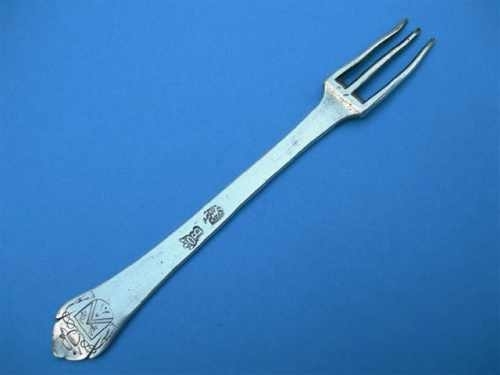 The fork was produced about 1660 in the town of AUTUN in Burgundy (of which the capital is DIJON). Today Autun is a small town of 16500 inhabitants. 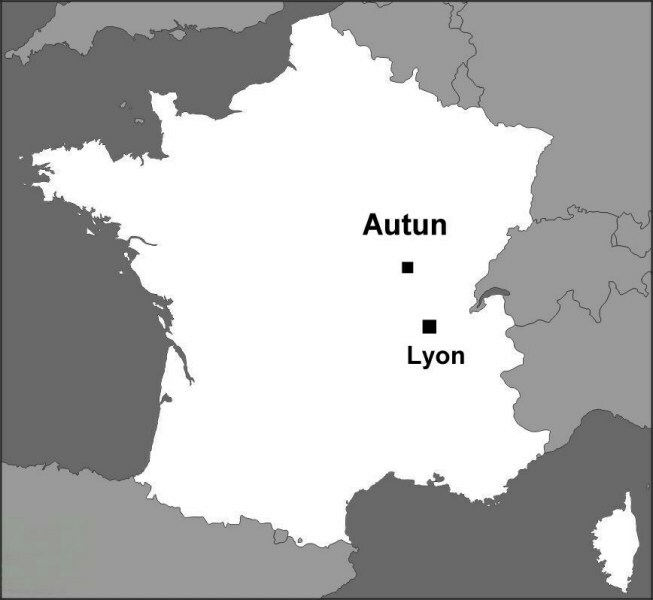 Autun was, during the seventeenth century, an important bishopric. 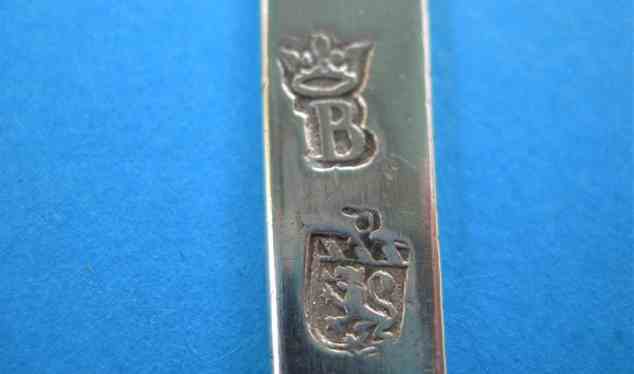 The source of the largest orders, at the time of this fork's making, was the bishopric for its needed religious pieces. Since 1647, the Autunian silversmiths has been regulated by the guild of Dijon. The average number of silversmith workshops was five during the seventeenth century. Their number remained close to five and was not much reduced until the eighteenth century. In 1759 the number had declined to one. 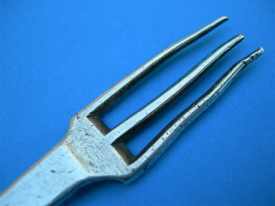 The fork appears in France in the middle of the seventeenth century. It originally had 3 teeth, and was probably not used to carry food to the mouth, but at the most to pick food up. The fourth prong added to the three precedents will give the fork its final form at the beginning of the eighteenth century. One notes a shoulder close to the tines on the stem. The handle has no shoulder. The fascination of the object presented here lies in this handle, slightly widened and ending in a form called "dog-nose"; slightly raised at its end. 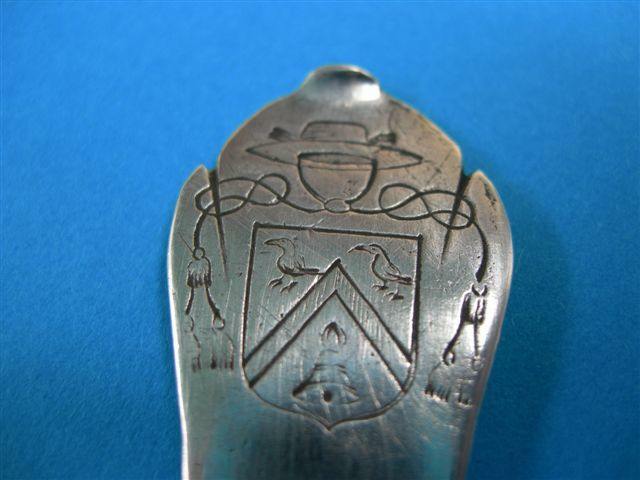 The spatule ending in a form called "dog-nose"
The contemporary armorial engraved on the spatula indicates that the owner of the fork is the bishop of the city. There is no evidence that the latter had more than one specimen of such an item, at most can one imagine that the bishop placed an order for what one then called a "service set", i.e. 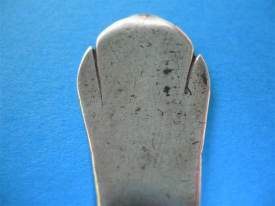 a unit made up of a fork and a spoon (described today as a "cover"). 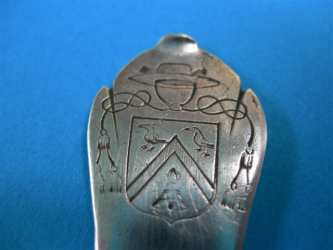 The spoon which should accompany the fork would commonly at that time have been with a "rat-tail"
- a P surmounting a shield with the weapons of the town of AUTUN, thus described: "with the lion crawling with the chief of Burgundy, of gold with 3 bands of azure " (see Remarks), which is the mark of the goldsmith Claude POMMIER, first registered in 1660, deceased in 1680 (its widow will take again the workshop until 1729). 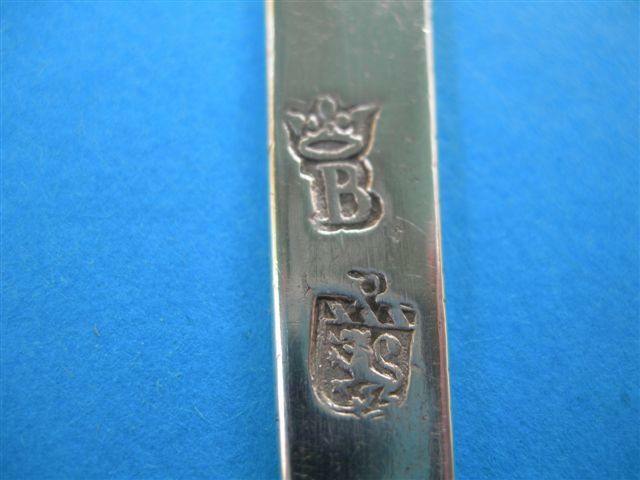 - as from the seventeenth century, most of the silversmiths living in the Burgundian cities stamped the first initial of one of their names above or below the armorial bearings of their city. This practice continued until the French revolution of 1789. Claude POMMIER?s mark has never been reproduced in a previous work, it was simply described, without absolute certainty concerning the positioning of the initial "P" of the Master. The image above confirms the mark and constitutes a discovery. - the lion appearing in the shield is a heraldic symbol and, as such, it is known as "crawling" in this position,? while at the same time it is proudly drawn up on its rear legs! 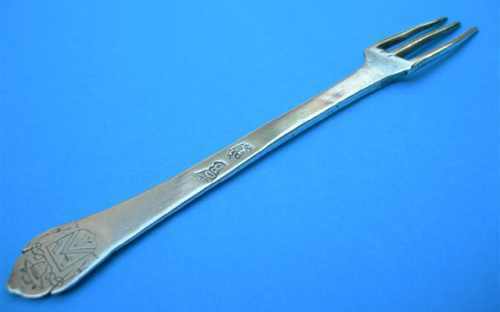 - the fork has no other marks and in particular, for dating purposes, does not have a tax punch. Since 1672 Louis XIV obtained to impose a tax on silver and gold items in all his kingdom and in 1677 a tax punch was introduced in AUTUN to show the payment of this tax. Following this reform, the tax collector ("fermier g�n�ral") struck silver objects with one (and later 2) marks proving the payment of the tax. The first punch brought into service in AUTUN in 1677 is a form of a P crowned in an oval. The fork, not having this mark, was manufactured there before this year. 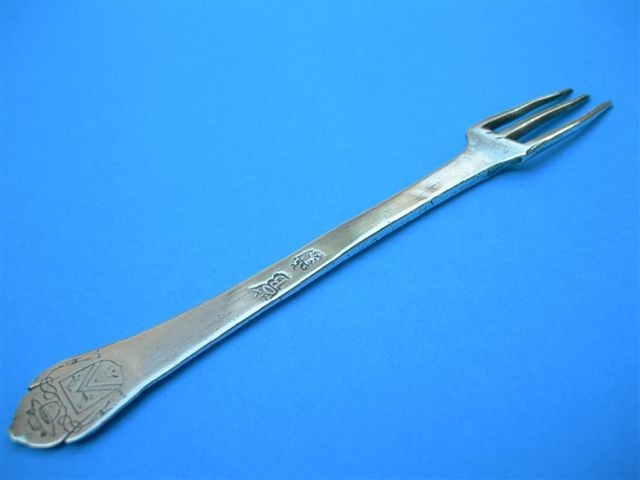 Eventually, one can thus estimate that the fork was produced during one period ranging between 1660 (initial registration date of the silversmith) and 1677. Maybe one could further reduce this interval using the armorial bearings of the bishop engraved on the object (for example if the ecclesiastic had taken his office after 1660). - the price of adjudication recorded at the time of this auction was of 1275 euros (1874 USD). A performance which could have been much higher, still, if the prongs had been presented in a better state for such a museum piece. - Weight = 39 grams.